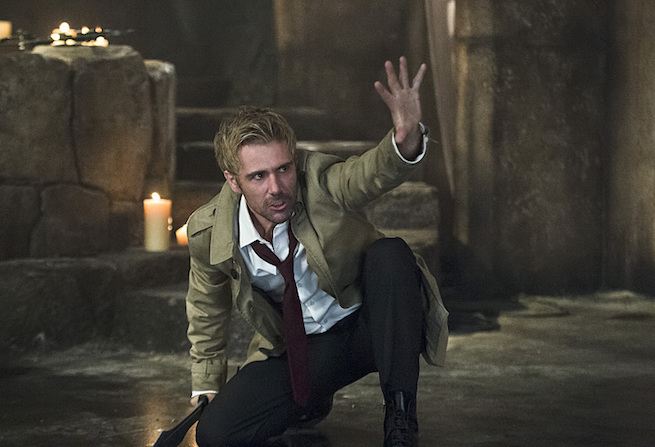 Arrow -- "Haunted" -- Image AR404B_0409b.jpg -- Pictured: Matt Ryan as Constantine -- Photo: Cate Cameron/ The CW -- ÃÂ© 2015 The CW Network, LLC. All Rights Reserved. If there was one thing promised about the new season of Arrow that most viewers were looking forward to, it was the announced guest appearance of a certain trenchcoat wearing, cigarette smoking master of the occult from a recently cancelled NBC television series who would be making his triumphant one-time comeback and unofficially joining the growing ranks of the DC TV Universe Warner Bros. and The CW have built up so well with Arrow and The Flash. That guest star is Matt Ryan, who reprises his role as John Constantine. He appears in the fifth episode of the ongoing fourth season of Arrow to help Oliver Queen and his friends restore the soul of the newly revived Sara Lance, who is all but herself after taking a dip in the Lazarus Pit a few episodes ago. As one of the highest rated episodes of the show and currently this season, here’s a Recap for “Haunted”… And naturally, there be SPOILERS if you haven’t seen it! 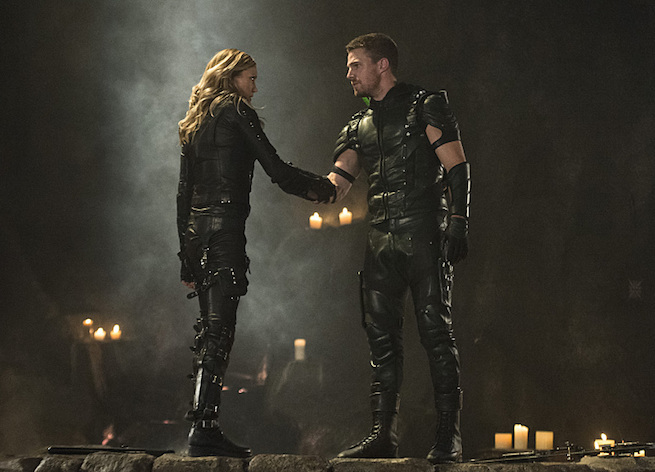 Previously on Arrow, Laurel Lance and Thea Queen traveled to Nanda Parbat with the deceased Sara Lance’s body in tow to convince the new Ra’s Al Ghul and Thea’s father Malcolm Merlyn to bring her back to life. They partially succeed, as Sara is alive but feral and a mere shadow of her former kind self. After concluding their business and returning to Star City, Laurel reveals Sara’s resurrection to her father Captain Quentin Lance. The “happy” family reunion is short-lived however, as Sara eventually escapes her chains in Laurel’s basement and is lost somewhere in the city. After a string of attacks by a “blonde crazy woman” leave men dead and short haired women attacked and barely escaping, Oliver and the rest of Team Arrow eventually find out about Sara’s resurrection, and proceed to try and stop her from unleashing more of her feral wrath upon Star City. Eventually, they realize that she’s targeting girls who look exactly like Thea – who under Malcolm’s influence last year killed The Canary and started the whole chain of events that forced Oliver to confront Ra’s Al Ghul and The League of Assassins. 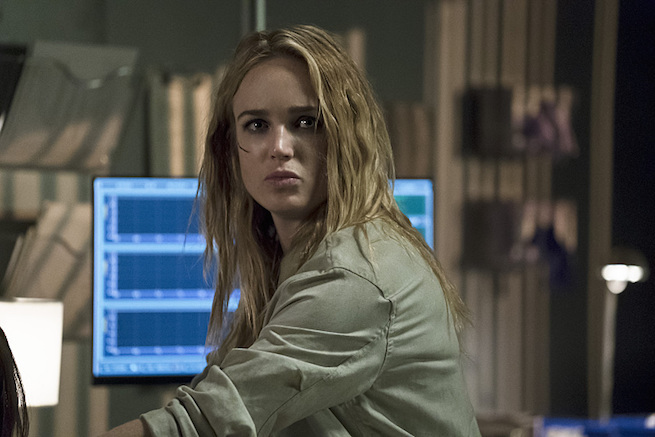 After Thea is attacked and hospitalized, she reveals the reasons for Sara’s feral nature. Much like her own bloodlust for the person that killed her, the uncontrollable Sara won’t stop until she gets her own measure of revenge on Thea, which puts Team Arrow in a quandary on what to do next. After finally subduing Sara and bringing her back to the new lair, Oliver makes a phone call and contacts an “old friend” who is an expert in supernatural instances like these… John Constantine. 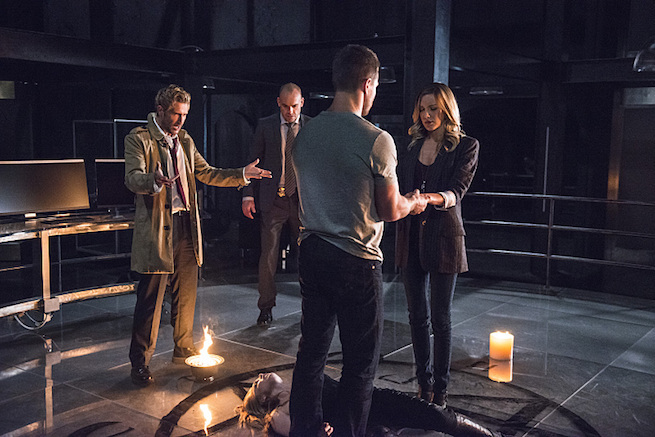 After arriving in Star City from god knows where, Constantine enacts a ritual to restore Sara’s soul to her body. 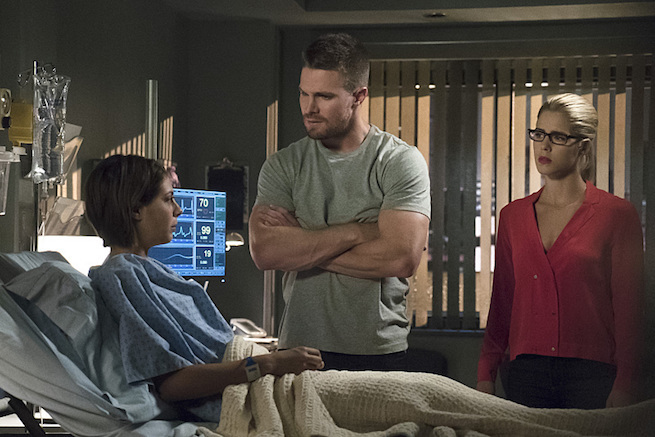 To do this, he also needs two other companions to venture into that realm where her soul resides, and that’s where Oliver and Laurel volunteer to go on the very dangerous journey to save and bring their loved one back whole. Arriving in a place that looks like Nanda Parbat, Oliver, Laurel, and Constantine battle dark versions of apparitions that look eerily similar to Ra’s and the league. Sara’s soul cries for help inside the Lazarus Pit, and the trio proceeds to fight the demons and free her. Back in the real world, the Lance family are happily reunited, and Team Arrow celebrates Sara’s successful return thanks to Constantine. With that problem solved John and Oliver have a brief moment of discussion about Damien Dahrk, and the former warns the latter to “watch his back” around that mystic user of a villain. Ollie then continues preparing for his campaign as Mayor, and despite being advised to distance himself away from Laurel by an advisor he rekindles his friendship with her. 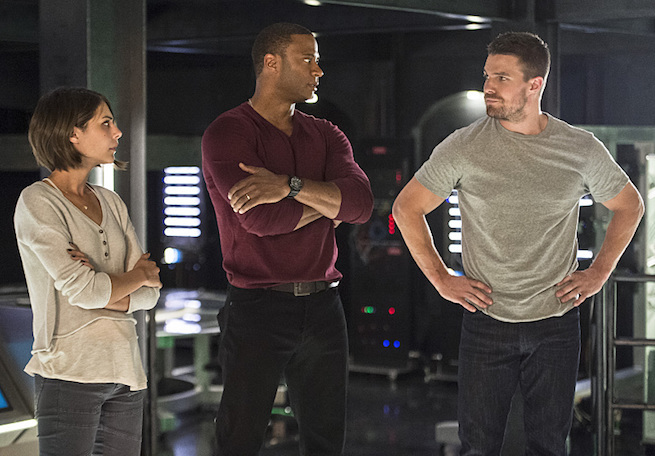 Meanwhile, John Diggle finally gets the information he wants about why his brother Andy was killed by H.I.V.E thanks to Captain Lance’s help, and in the flashbacks the audience learns how Constantine and Oliver met for the first time… In Lian Yu of all places and after both prevent an artifact from falling into the wrong hands. And THAT was certainly a fan service of an episode for Constantine fans! 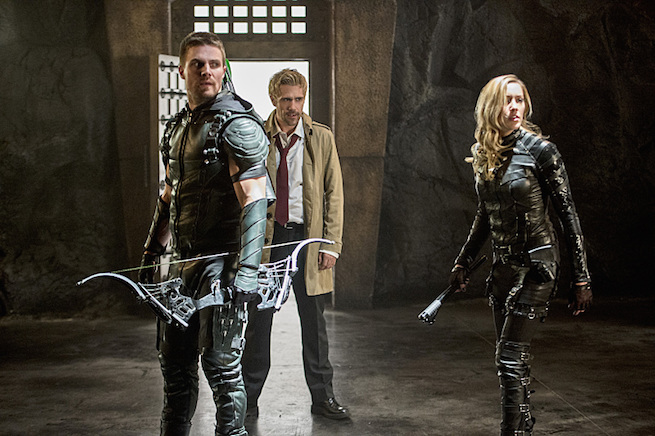 After getting cancelled after just one season, many were holding hope that the Con Man would be revived in some way and form, and The CW delivered just that by inviting Matt Ryan back to his signature role for a one time appearance in Arrow! While it’s just for this one instance, the door is certainly open for his return in the future, and we’ll can only guess when this fan favorite “Hellblazer” will come back… He’s part of a bigger universe now! Catch Arrow every Wednesdays on The CW, and on international channels like Jack TV and Warner TV on their respective schedules. Previous articleWATCH: First Warcraft: The Movie trailer released!